This entry was posted in Health & safety solutions on 2017/06/14 by Susan. More employers are using broadband alarms as a back-up warning. But researchers want to know: just how effective are they? Broadband alarms are already used worldwide. By now, workers in B.C. and Alberta are likely hearing more of them. So how do workers perceive the multi-frequency broadband alarm (BBA) sound used in place of the traditional single-tone “beep-beep-beep”? Do they recognize it as a warning? Researchers in WorkSafeBC’s Risk Analysis Unit (RAU) want to find out. So they posted this Broadband Alarm Survey. Heather Kahle, a human factors specialist in the RAU, says that many studies show the advantages of BBAs, but few evaluate workers’ perceptions of the BBA sound or the effect the signal has on worker safety in the field. Workers may not hear the traditional tonal alarm over background noises. 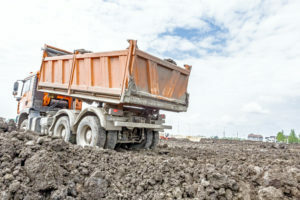 On a construction site, for example, different vehicles and pieces of equipment are coming and going and being active on the site throughout the day. With so much machinery emitting beeping and alarm sounds amid typical construction-site noise, the tonal alarm sound may not be effective at warning workers in the area of a reversing vehicle. This story in the November/December issue of WorkSafe Magazine (page 13) describes how the University of Victoria and Whistler are using broadband alarms. The article also emphasizes the risks workers are exposed to when they are near backing vehicles and mobile equipment. Between 2003 and 2012, ten people died in B.C. in incidents involving reversing vehicles or equipment. This is why more solutions are needed. If you have heard the new multi-frequency broadband alarms before, or know of others who have, you can help by completing or forwarding the survey, which will be online until the Fall of 2017.